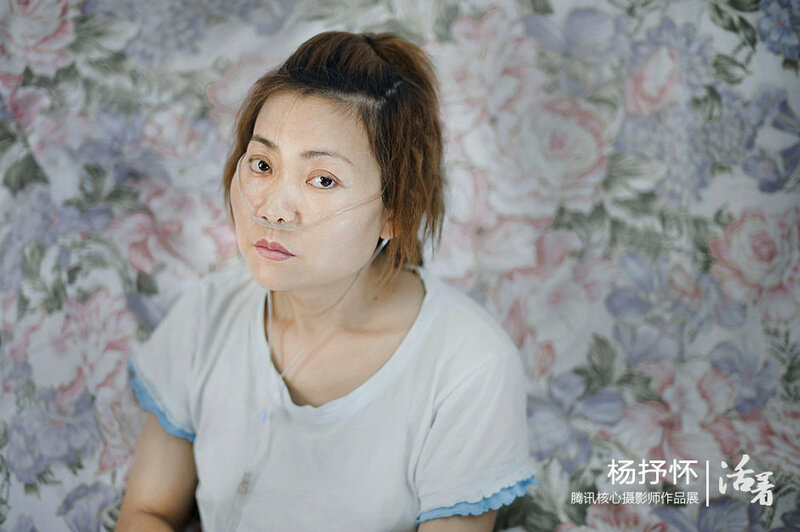 [Above] “A Story of Corneas”: June 1st, 2011, in a small, simple house, Zhu Xiaoyi was sitting on the bed, having nutrient fluid infusion and inhaling oxygen. There was no strength in her eyes, and it was very difficult for her to breathe. Knowing that she didn’t have much time left in the world, Zhu Xiaoyi made another decision: to donate her corneas. At 10 o’clock in the morning, on June 17th, 2011, Zhu Xiaoyi was gone. Perhaps touched by her daughter’s spirit, the mother agreed to the donation before the death of her daughter. 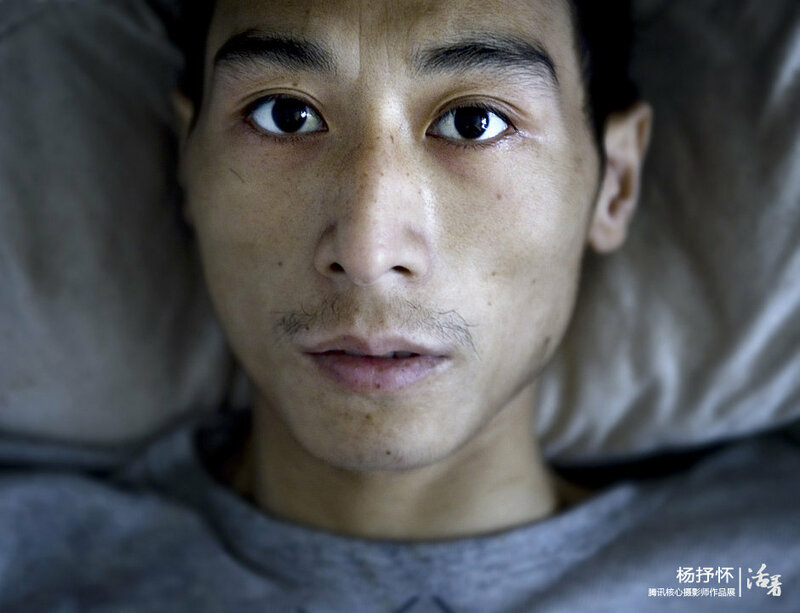 “A Story of Corneas”: In June 2011, Yang Chunhui entered the final countdown of life. His body was so weak he couldn’t even take a ride home. He lied weakly on the bed, darkened eyes wide open. 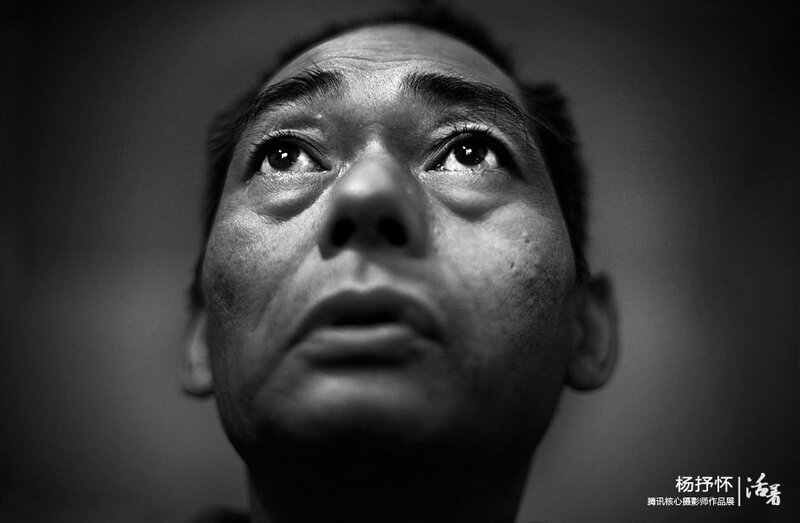 After he died, his corneas helped 3 patients with eye illnesses to see light again. 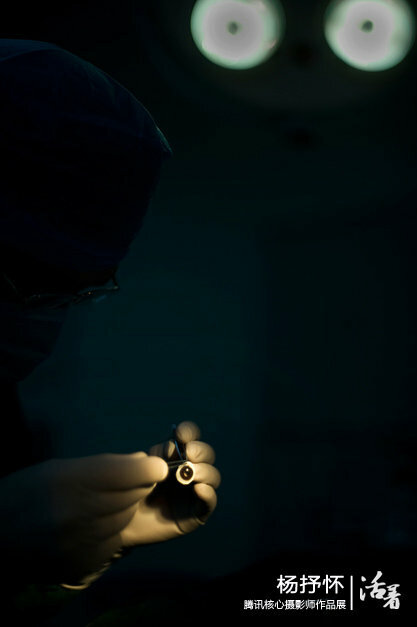 “A Story of Corneas”: July 20th 2011, in the hospital operating room, the doctor was cleaning up cornea donor Yang Chunhui’s corneas. In August, Yang Chunhui’s corneas were immediately used for curing patients. A 76-year-old Ning Beiying, and a 19-year-old college student Liu Zong were cured. This was the last gift he gave to the world. 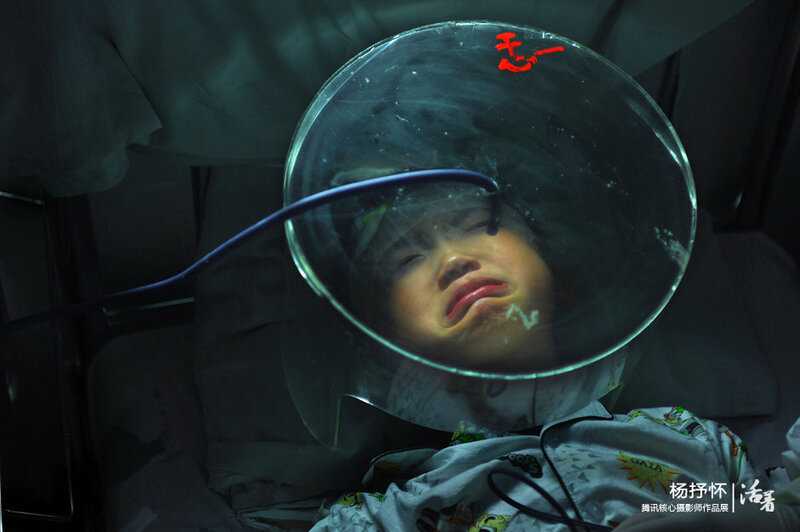 “The Story of a 6-Year-Old Boy Fighting Against H1N1”: November 8th, 2009, in the H1N1 Intensive Care Isolation Ward of Hunan Province Childrens Hospital, doctors performed facial respiration on Little Han Han after removing the respirator. “Black Kiln Slave”: September 25th, 2010, in Hunan Province Xiangtan City Yuetang District Shunjiang Village, Zhou Daoming’s looked at this strange world with a vigilance in his eyes. 17 years ago he had gone missing, imprisoned in a black [illegal] brick kiln for 14 years, finally returning to his hometown 3 years ago in a filthy unkempt state. 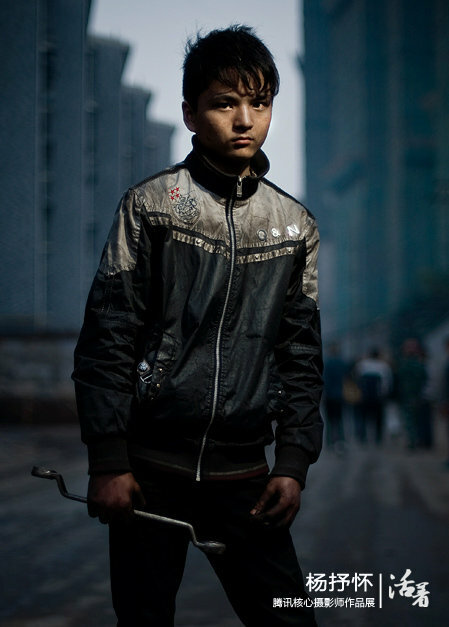 Slavery, poverty, sickness, forgotten and abandoned… Zhou Daoming is a microcosm of numerous kiln slaves who survive on pecking mud in the black brick kilns. “Free Lunch”: May 4th, 2011, in Hunan Province Loudi City Xinhua County Fengjia Town Henglaping Village，at Happy Primary School. That evening, volunteers made supper for the students who lived nearby. 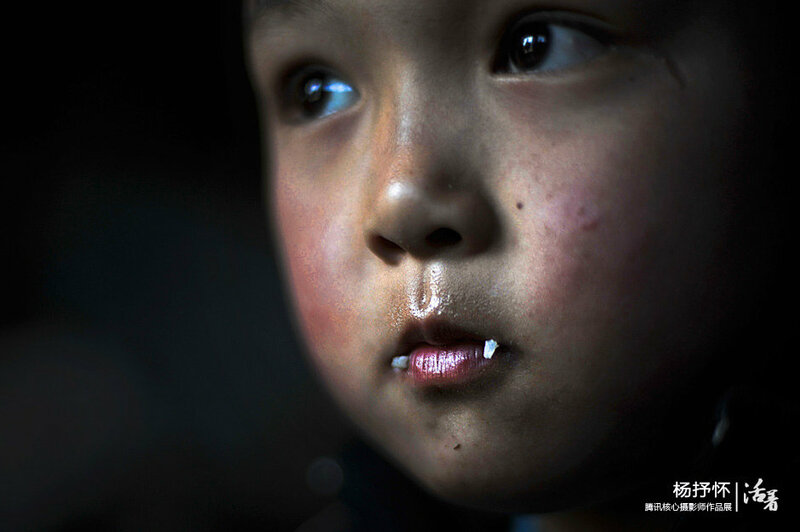 The 8-year-old Feng Xian ate very happily, with some rice still left around the corners of his mouth. “The Zhong Sisters of Huangyi”: December 22nd, 2010, Zhong Rujiu and her big sister Zhong Ruqin, in the ward of Beijing 304 Hospital. Zhong Rujiu said when she was little, her big sister used to hold her warmly like this. On September 10th, 2010, in Jiangxi Province Haungyi County, Zhong Rujiu and her family had a conflict with relocation and demolition personnel due to relocation disagreements. Zhong Ruqin, Luo Zhifeng [Zhong Rujiu’s mother], Ye Zhongcheng [Zhong Rujiu’s uncle], the three of them lit gasoline and set themselves on fire. 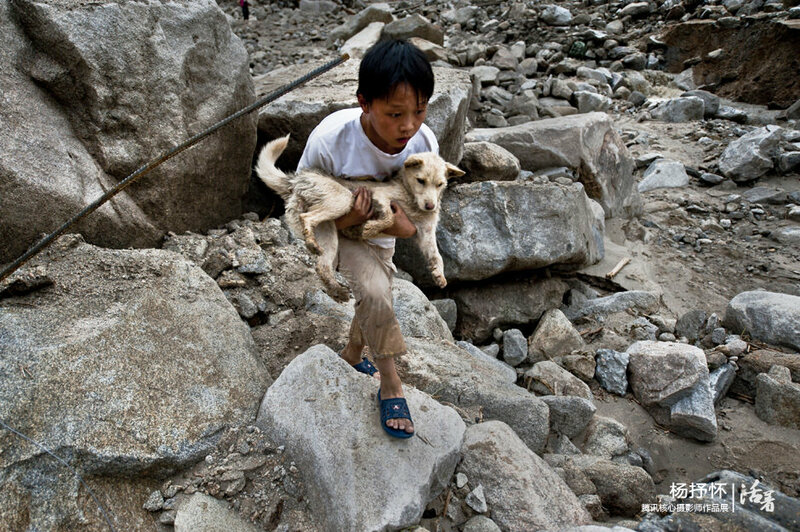 “Orphan in the Storm”: June 11th, 2011, China Hunan, in Yueyang’s Linshang City Guanshan Village, Mao Luojian held his dog tight, walking in the ruins. After the mudslide happened, the dog stayed without eating and drinking at the house door waiting for its masters to return. Mao Luojian’s parents were both killed in the disaster. “Yueyang Mudslide”: June 10th, 2011, at the Old Town government of Linxiang City Zhanqiao County, family members were washing the mud off from the body of their deceased kin. “Earthquake Teenager”: April 24th, 2010, the light shone into the Hanwang Primary School gym, make it look like an imaginary world on a stage. 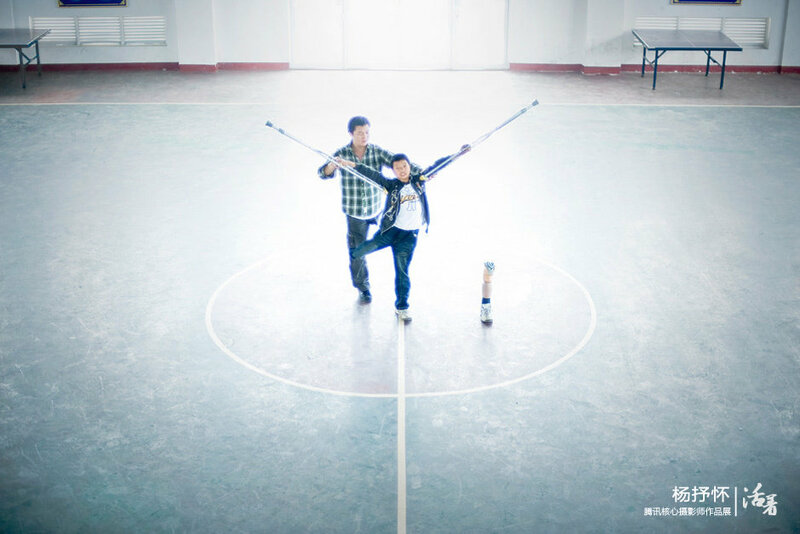 The handicapped teacher Cui Youjun——who also lost his lower leg——adjusts the dance posture of teenager Guang Lin, who had been amputated because of the Wenchuan earthquake. 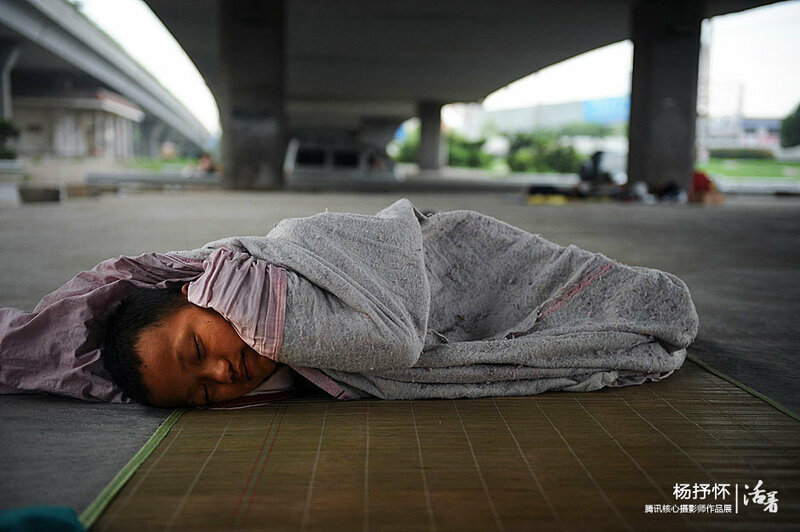 “Rural Worker Child’s Summer Vacation”: August 8th, 2009, under the Gaoqiao overpass of Changsha, 13-year-old Yang Qing was lying on the mat, asleep. Over the past few days, he has been suffering from an unrelenting high fever. His mother depends on shining other people’s shoes to make a living. The understanding boy knew it was very expensive to go to the hospital, so he suggested that he come under the overpass for the breeze. “The Bar”: October, 24th, 2011, in a bar on Jiangxi Road of Changsha, rapper Da Bin shows his new tattoo. “My life is unconventional/licentious, like a dog.” “The Hotdog Crew” [by MC HotDog] is the song Da Bin is best at. Da Bin says singing is to sing his own life. 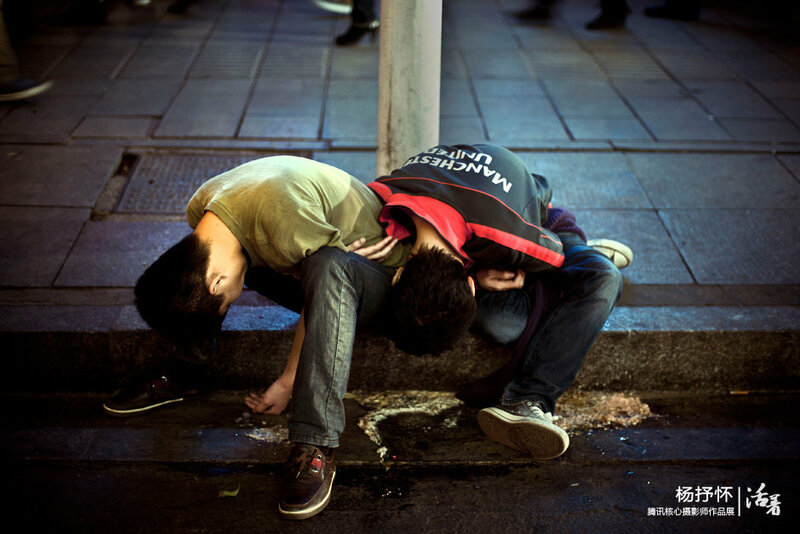 “The Bar”: November 15th, 2011, Jiefangxi Road, drunk young men. “The Bar”: October 31st, 2011, a heavily made up woman was sitting on the curb, making a phone call. 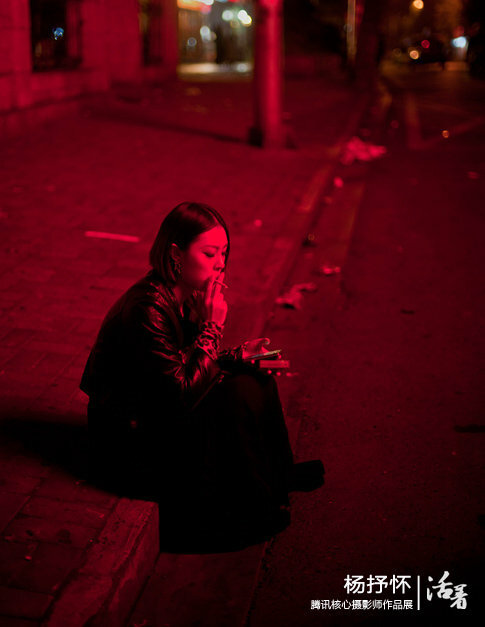 The neon turned the smoke rings red, one after another. 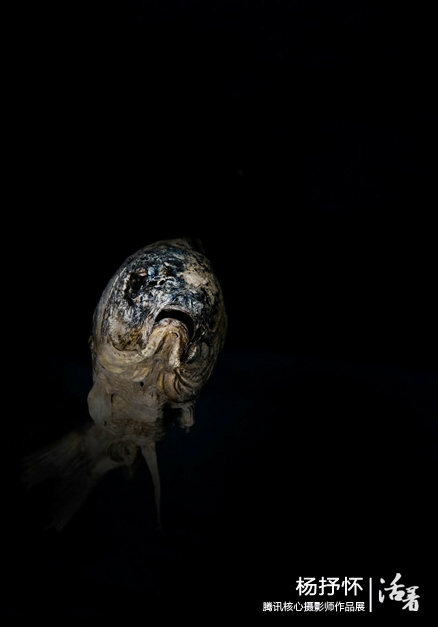 “A Dead Fish in the Drought”: By the shoal of the dried lake, a bream was spotted, it was stiff. In its death it lied with its head facing the lake’s surface. 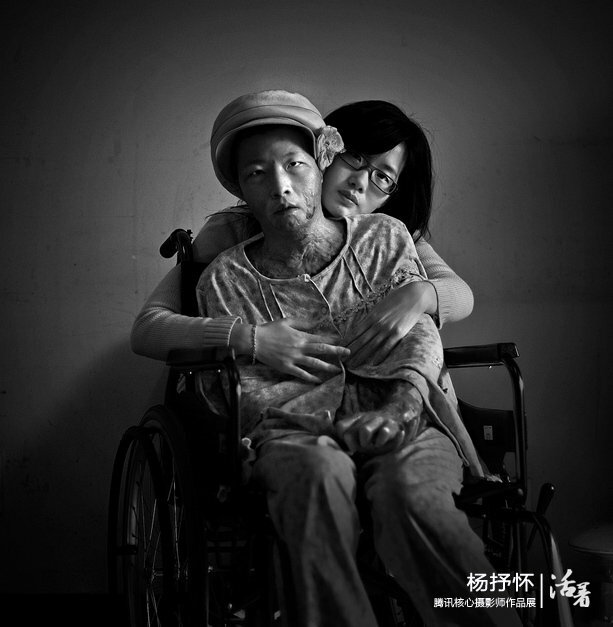 In a studio of Changsha, the press-photographer had captured its last moment. According to the Xinhua News Agency’s November 7th, 2009 report, the surface area of the second largest freshwater lake Dongting Lake in our country in October was only 537.84 square kilometers, a sudden nearly 60% drop since September. 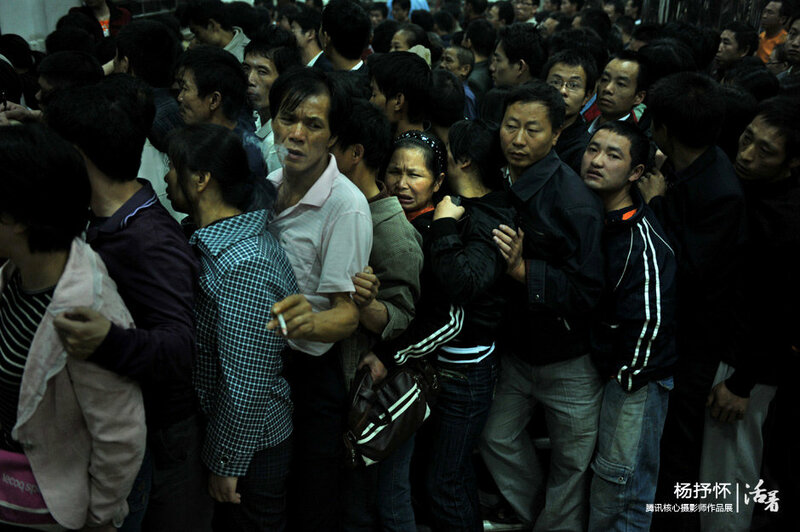 “Waiting All Night, Just for a Pass to See the Doctor”: October 26th, 2009, at 5:30, at Xiangya Hospital of Changsha, Hunan, citizens were waiting in lines to register. Everyday, at the gate of Xiangya Hospital, there are numerous people waiting like this. They stay up all night long, with no sleep, holding their ground on the cold floor, wearing drowsy looks in the chilling wind. There is, but one purpose, to get the pass that grants permission to see the doctor. 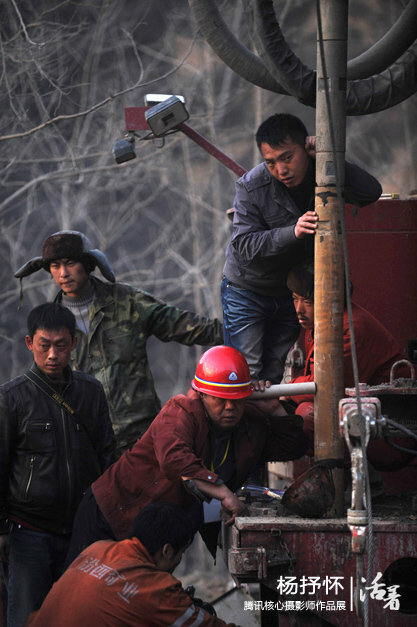 “Shanxi Wangjia Ridge Mine Disaster Rescue”: April 2nd, 2010, at 14:15, the vertical drilling at Shanxi Wangjia Ridge Coal Mine No.2. Rescuers heard the sounds of tapping on the drilling pipe from below. They immediately struck the drill pipe in reply and shouted down, and shouts were returned from below. At this moment, it had been 120 hours since the mine disaster happened. 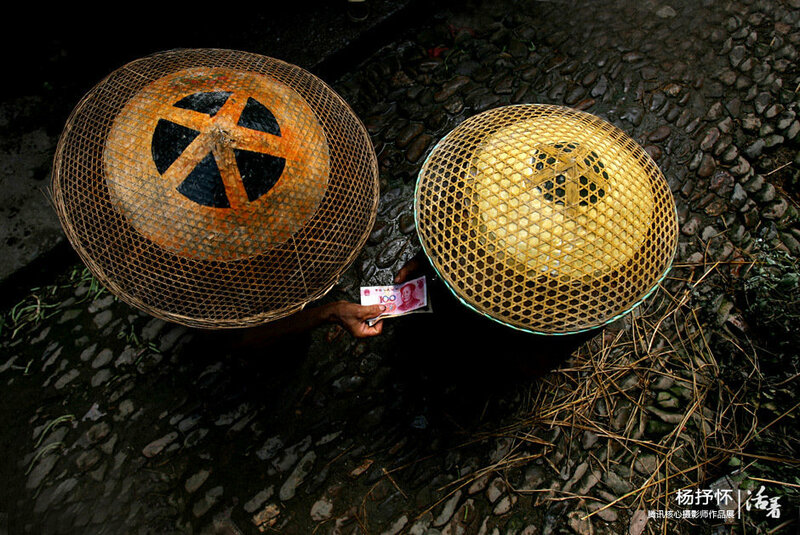 “The Long March”: May 28th, 2006, a transaction on the roadside of Haofu village, in Hunan Province Dao County Shouyan Town. Back then, the Red Army passed through this place, and the granite road has been witness to history, but nowadays things have changed. “The Child who Wakes up the Earliest in Changsha City”: September 14th, 2009, 5:12am, the day has just broken. 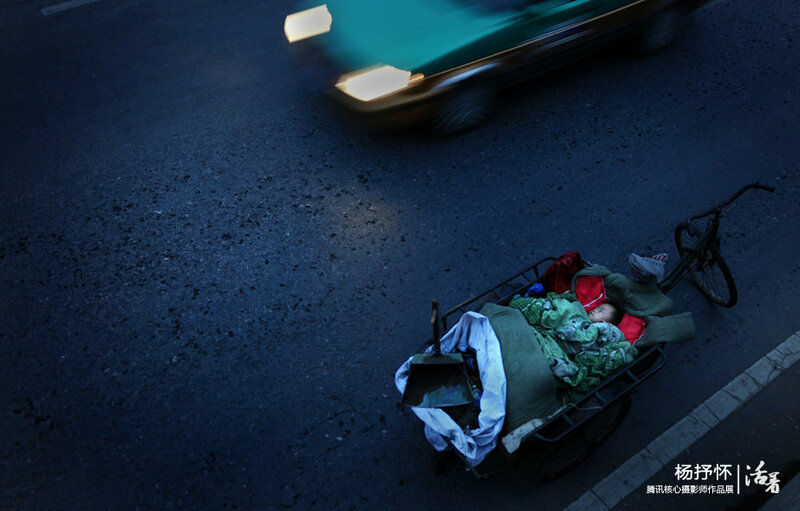 The mother pulls Yang Tuo on the Yangjiashan Overpass, beginning a day of cleaning and sweeping work, while Mao Tuo sleeps in the tricycle. 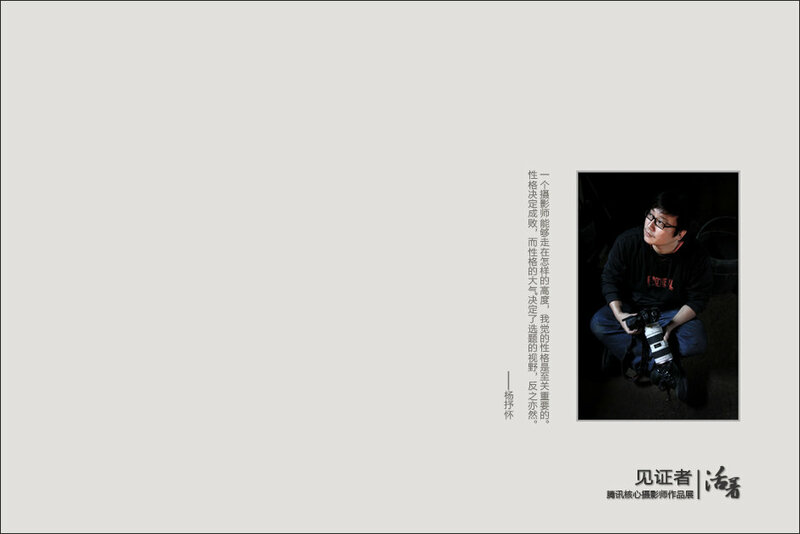 The photographer’s intro: Yang Shuhuai, member of the Chinese Photographers Association, chief reporter of Xiaoxiang Morning News. The winner of annual best photograph of Golden Lens, China News Award, one of the ten national photographers of Free Lunch, volunteer of Aier Eyebank. Seeing these photos, my heart twitches. I love my homeland deeply, when can it truly enter civilized society? Always saying we should thank the government when they help the ordinary common peoples. But the government, you know, helping those ordinary common people, that’s your duty, you were born to serve them, and they don’t need to thank you, because you are fed/provided for by them. If you help them and they have to thank you, then when their lives are down and out, who’s should be blamed? I can’t help but shed tears seeing these photos. How come each and everyone of these vivid lives can’t get society’s true concern?? Two Sessions year after year, but what has really been solved? This is the charm/power of photography! Seeing these photos, I feel my own cowardice. Graduated form college for 2 years, now passively walking on the road of starting my own business. Facing a strange society, and a pile of complicated connections and banquets, I’ve been escaping, backing off, raging, and accusing. So I stopped. I thank the people who record life through the lens. I will try to learn to be content, be thankful, and live optimistically. Accept the things that cannot be changed, try hard, and hope that one day I can change them. I’m a migrant worker too. Only migrant workers themselves know the hardship. We are merely passers-by of the city. We leave our youth to the city. Beautiful tall buildings are left in the city, with not a single bed belong to us to sleep. Perhaps we’ll come again next year, because within the city lies our hope. This is our homeland, and to say speak crudely, it is a whore that fashions herself a virgin, glamorous on the surface but rotten to hell in its bones. It’s not the eyes that perceive the world but your heart. The photos are touching, they are all around us!!! Living in this world, living in these cities, despite being in the midst of all the bustle, we feel the soul’s emptiness. Seeing all of this misery hidden under the glamour, all the words in the world still pale in comparison. Our greed and desires for luxury in our hearts suddenly have become so shameful. When can these people who live at the bottom stop stinging our eyes? They will always make us feel ashamed! And speechless! Who can provide them the basic needs? The government? The parent-like officials? How long can kind people’s help last? Where is their way out?